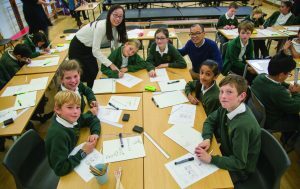 GOLDSWORTH Primary School has played host to two teachers from in China as part of a worldwide scheme to revolutionise maths teaching. The visit was part of an exchange in which Year 2 teacher Georgie Samuel spent two weeks in the Chinese city of Shanghai earlier this year learning more about advanced techniques, and taking a lesson. Earlier this month, Yan Wang from Shanghai Pudong New Area Yugiao Primary School and Weijie Ou from Jinyuan Senior High School made the reverse journey and taught in Woking. Georgie said that Mr Ou taught her class while Miss Wang led Ruth Barrett’s 6B. The main event of the exchange was lessons on consecutive days by the Chinese teachers in the school hall – observed by 70 visiting teachers from across the county. Georgie said the Year 6 children told her they enjoyed the Chinese style of teaching maths. Some found it tricky at first but developed their resilience. “The Year 2s enjoyed Mr Ou’s lessons, in particular his use of number lines and comic characters to introduce concepts which they found fun,” she said. The exchange scheme is part of an effort to promote “mastery” techniques in maths and other subjects. The aim is to ensure that children understand a particular concept before moving on to the next one and do deepen their understanding rather than move on quickly. Georgie, who lives in Old Woking with husband Tom, an IT consultant, and children Bobby, 10, and Harrison, 8, said the Miss Wang and Mr Ou declared that Goldsworth Primary School was “lovely and beautiful”. The Chinese teachers told the News & Mail they enjoyed their time in Woking and the brief amount of time they were able to spend sightseeing. “You have a very beautiful church,” Mr Ou said.